As a kid, I had multiple things on my list of “Things I Want to Be When I Grow Up.” (Good thing my “clown” phase only lasted for a day.) But even after I grew out of most of them, there was one that I still wanted to do: be a makeup artist. It all started with my color obsession in elementary school. I would mix and match each crayon with a complimentary color, and only use them together. Once I started wearing makeup, I discovered something way more fun than coloring on paper — I could color on my face. After a few tries (hilarity ensued), I realized makeup skills aren’t something you’re just born with. I actually needed to learn how to do makeup. So imagine my excitement when I got the chance to go to makeup school for an entire day. I arrived at the Make Up For Ever studio in Hollywood, Calif. an hour early, with my entire collection of makeup brushes in hand. 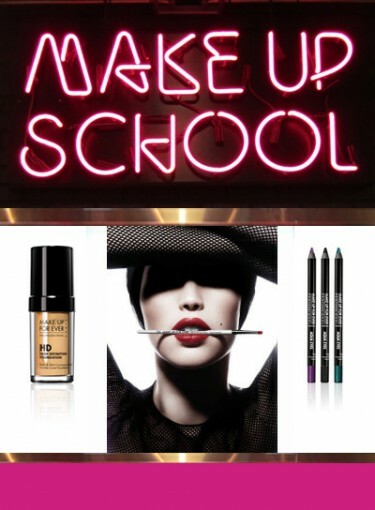 Click here to find out what makeup tips I learned from makeup school. Best eight hours of my life. The instructor walked me through a ton of tips I had never heard before. I found out exactly where to dust bronzer to make my cheekbones pop, and which product I shouldn’t waste my money on. She even covered a few tricks the pros use when they’re doing celebrity makeup. By the end of the lesson, I was even more hooked that when we started. So I tracked down other makeup school instructors and hounded them for their secrets. Click here to check out all of the beauty tips I dug up. Then, watch this exclusive video I took at makeup school to learn how to apply false lashes the right way.